The Model 272 3-Phase Current Unbalance Detector monitors 3-phase lines to detect an unbalanced current. 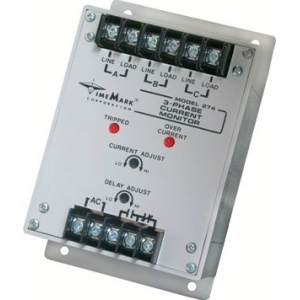 It can also monitor three separate single phase lines for equal current levels. 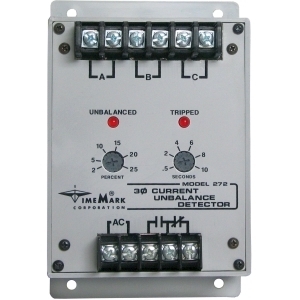 The percentage of unbalance is adjusted from 2% to 25% by adjusting a front panel control. An unbalance greater than this setting energizes the relay. An adjustable trip delay of 0.5 to 10 seconds is also provided. For optimum performance, operating currents should be kept in the 1 to 5 amps range. However, zero current on each phase is considered to be a balanced condition. Continuous currents, up to 10 amps per phase, will not damage the unit, nor will current surges up to 40 amps for 2 seconds. The contacts are automatically reset when the unbalanced condition is corrected. The Model 274 3-Phase Current Monitor is designed to monitor all legs of a 3-phase line, and can also be used to monitor three individual single-phase lines. The output relay will energize on an over-current condition on any one of the 3 monitored lines. Two indicator lamps are provided to show when an over-current condition exists and when the output relay is tripped. An adjustable trip delay of 0.2 to 20 seconds is provided to reduce nuisance tripping. Matching current transformers are available to extend the range of the device to most any range up to 1,000 amps. The Model 274 is offered in either manual or automatic reset models. An external power supply of 24, 120 or 230 VAC powers the device. 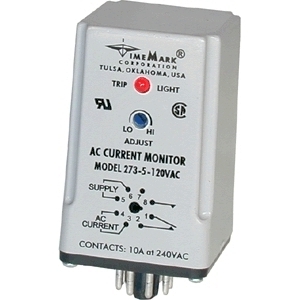 The Model 273 Single Phase Current Monitor is a single set-point sensor. It can be used as either an over current or under current sensor, depending on the contacts used. This device can directly monitor AC currents in the range of 0.5 to 5 amps: or 2 to 10 amps, 50 to 400 Hz. Matching transformers are available to extend the use of the monitor to most any range. The current being monitored can be of any voltage, up to the rating of the socket. An LED indicator is provided to show when the relay is energized. The Model 273 is available for either 24 VAC or 120 VAC supply voltages. Model 273-5 is UL Recognized and CSA Certified. All versions use a standard 8-pin socket. The Model 274 3-Phase Current Monitor is designed to monitor all legs of a 3-phase line, and can also be used to monitor three individual single-phase lines. The output relay will energize on an over-current condition on any one of the 3 monitored lines. Two indicator lamps are provided to show when an over-current condition exists and when the output relay is tripped. An adjustable trip delay of 0.2 to 20 seconds is provided to reduce nuisance tripping. Matching current transformers are available to extend the range of the device to most any range up to 1,000 amps. The Model 274 is offered in either manual or automatic reset models. An external power supply of 24, 120 or 230 VAC powers the device.